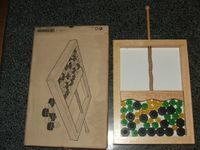 The Ikea edition has a wooden frame and painted wooden pieces. The box is unpainted cardboard with no title, just a black ink drawing of the game. Also appears to be be called Trappola.